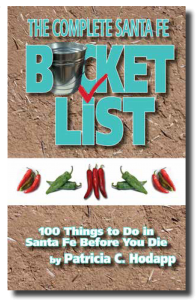 Santa Fe, New Mexico—Pat Hodapp, director of the Santa Fe Libraries will read from and sign her book “101 Things to do in Santa Fe Before You Die” at Collected Works and the Santa Fe Public Library in June. It is a light hearted and witty guide book to all things Santa Fe. From the O’Keeffe Museum to where to find the best chocolate. From finding inexpensive ways to enjoy music and the opera. Hodapp has them all. Hodapp will read from her book and sign her book at Collected Works Bookstore and Coffee Shop on Thursday, June 9 at 6:00 pm, at 202 Galisteo Street. The Friends of the Santa Fe Public Library are hosting a reading and signing at the Main Library, 145 Washington Avenue, on Sunday, June 12 at 2:00 pm. Refreshments will be served. and distinctive fun that makes The City Different one of the greatest tourist locations in the U.S. There are 100 things that she thinks are noteworthy including: green and red chile; El Rancho de las Golondrinas; sunsets; blue skies; art; museums; Canyon Road; and the Plaza. What Other People Are Saying About This Book . . . Partial proceeds of the sale of Hodapp’s book will benefit the Santa Fe Public Library. For more information contact Pat Hodapp at 505-690-8620 or contact the publisher LPD/Rio Grande books at paulpd@aol.com or (505) 344-9382.